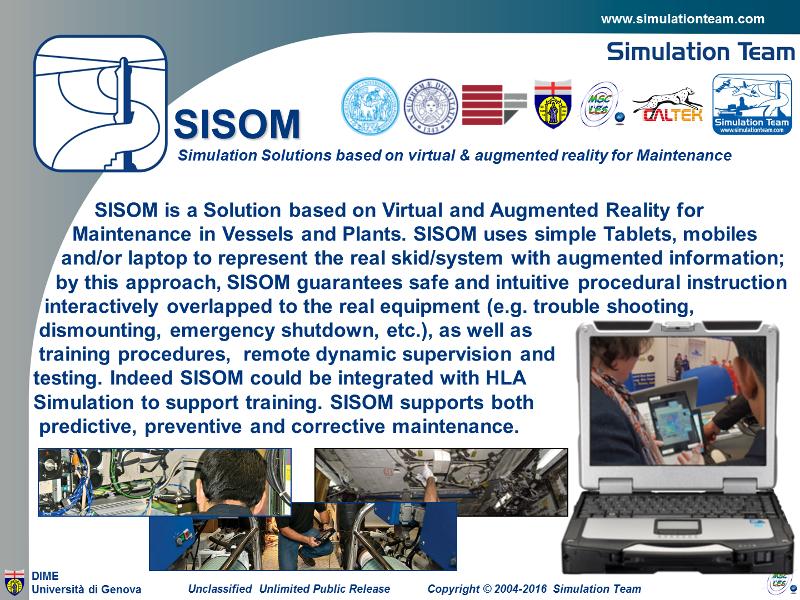 SISOM is a Solution based on Virtual and Augmented Reality for Maintenance in Vessels and Plants. SISOM uses simple Tablets, mobiles and/or laptop to represent the real skid/system with augmented information; by this approach, SISOM guarantees safe and intuitive procedural instruction interactively overlapped to the real equipment (e.g. trouble shooting, dismounting, emergency shutdown, etc. ), as well as training procedures, remote dynamic supervision and testing. Indeed SISOM could be integrated with HLA Simulation to support training. SISOM supports both predictive, preventive and corrective maintenance.